January has been and is going (if not gone) in a flash! A quick reminder that tonight is the first meeting of the Teesside Archaeological Society for 2017 (on a Newcastle site) and the following day sees another by the Till Valley Archaeological Society (on Roman Binchester). We have continued to update our CBA North website pages with events from the Northumberland Archaeological Group, one of our group members, and hope to have emails out to you in February to bring you further news soon. Details of the next three Northumberland Archaeological Group [NAG] lectures have now been added to our Events page. Though January is almost over these additions take the list up to 65 and more events, including our own, are promised to come. Please let us know any questions, comments or information that you have by emailing cbanorth@archaeologyuk.org. This entry was posted in E Newsletter and tagged Binchester, lecture, NAG, Newcastle, TAS, TillVAS on January 31, 2017 by cbanorth. The past year has seen the commemoration of many historic events including the Battle of Hastings, the tercentenary of Capability Brown’s birth, the founding of the Cumberland and Westmorland Archaeological and Antiquarian Society 150 years ago and the 100 years since the Somme to name just a few. Unfortunately one of the events of the past year has also been the disbandment of the Association of Northumberland Local History Societies in its 50th anniversary year, an organization similar to our own representing groups and individuals interested in the past of the region. The turn of the year, therefore, is an appropriate time to look both forwards and backwards for CBA North. Currently there are about 200 Members of CBA North through the positive opt-ins of National members and as North region members alone – thank you for your support it is much appreciated, some seven local archaeological group members (representing something like 730 more again) and 1130 or so followers of our Twitter social media. All these numbers are slowly, generally, rising although new members and followers are always welcome through any of the possible permutations of membership. Hand-in-hand with membership we continue to look at what we provide to you as benefits of being a member, as well as seeking to improve the information provided to us. Whilst we have provided emailed information to you, we have also given opportunities for presentation and networking in other activities as well. Unfortunately, opportunities to hear two talks by local groups of their fieldwork, as well as a behind the scenes tour of Corbridge Roman Town (2016 AGM) in addition to contributing to the group’s work in the business of the meeting, and the chance to visit excavations at Derwentcote the following month only had very limited support. We are well aware of local groups publicizing their work in a very limited fashion, and these could be more generally shared through the CBA North network, allowing the full sharing of knowledge, skills and experience. It is with the continued aim of building up the network up that we are organising an event for March/April (date to be confirmed) to be held in Newcastle. This, and other information in future, will be emailed out to Members first (please make sure we have a current email address) before it becomes available for our Followers and website. We hope that you continue as a member, and others will join also, on seeing the benefits of membership. We really want you, either individually or as group members, to see what real benefits you have in being a member, and increasingly get involved in our activities. We can do much together where an individual or small group cannot. Our webpages have been revised for 2017 and now include some photographs of CBA North Committee. All, myself, included represent different sectors and groups, audiences and by dint of their location areas, of our region; please contact and discuss with them your thoughts for CBA North. Once again information on meetings, events, and other materials for the emails to Members, are welcomed by Committee. We are the regional archaeological group and can help smaller groups to promote their own activities, events and fieldwork to a wider audience, as well as being increasingly being consulted and involved as well as promoting regional activities on your behalf. It is only through your contributions and comments that we can best represent you and your interests with our contacts – as CBA National itself says Participate, Discover and Advocate! We’ve also updated our CBA North website pages with a list of all 52 or so of the 2017 events known to us from the programmes of a number of local societies. Please feel free to let us know of any more that you know of – either as part of a regular series for the Events page or as specials – throughout the year. If you can’t see your local society’s programme here, please let us know if you want that adding in. Please let us know if your society’s details are incorrect or need amending. All details are correct to the best of our knowledge, however it is suggested you confirm with the appropriate organisation and the contact details given of the local societies. 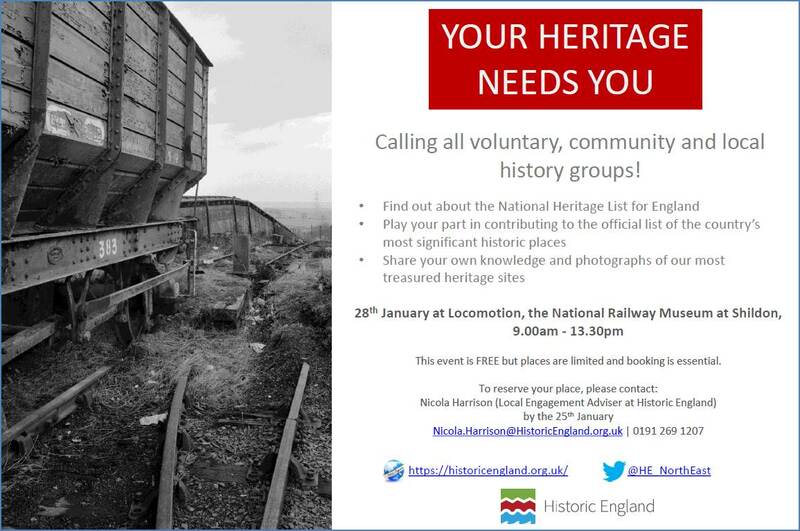 The best way to contact us is through emailing cbanorth@archaeologyuk.org. Enjoy! As ever check with the local society concerned for any further details that you may need. Their details can be found on our Local Societies and Groups page. This entry was posted in E Newsletter on January 2, 2017 by cbanorth.